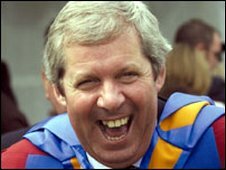 Ex-Olympic athlete Brendan Foster CBE has resigned as chancellor of Leeds Metropolitan University. Mr Foster told BBC News he gave his resignation on 12 January, two days before vice-chancellor Simon Lee announced he was resigning. Mr Foster became the university's chancellor in 2005. In March, the university's board of governors is due to discuss a proposed increase in fees for the academic year beginning in 2010. Mr Lee pioneered the "low-charging, high-impact" tuition-fee policy. The university currently charges £2,000 per year, the lowest fees in England. The proposals, if accepted, will see the charge go up to £3,000. Ninian Watt, the university's chair of governors, said: "Brendan Foster has been a great ambassador for the university and we are grateful for the significant role he will have played in the four years of his tenure. "With the pending appointment of a new vice-chancellor, Brendan believes it is an opportune time for the university to seek a new chancellor." Mr Foster, a founder of the Great North Run, broke the world record for running two miles in 1973, won a bronze medal at the 1976 Montreal Olympic Games and a gold medal at the 1978 Commonwealth Games. He retired from athletics in 1980 and was made an MBE for his achievements. He was appointed CBE in 2007. Dr Geoff Hitchins, a former vice-chancellor of the university, was appointed acting chief executive on Wednesday. Mr Watt said Dr Hitchins would lead the university's management team until a new vice-chancellor was appointed. He added: "The whole board want to acknowledge the transformation of the university under the leadership of Professor Lee. "The university is in a very strong position and we will build on that."